Jane was born in Wyndham, East Kimberley in 1972. She grew up on Texas Downs Station (her mother’s country) and where her father worked as a stockman for many years. She resides at Warmun Community and works with children participating in a Community Education Project at Warmun. Jane’s late husband was also an artist and they have five children. Jane is the daughter of one of Australia’s best known artists, Rover Thomas. 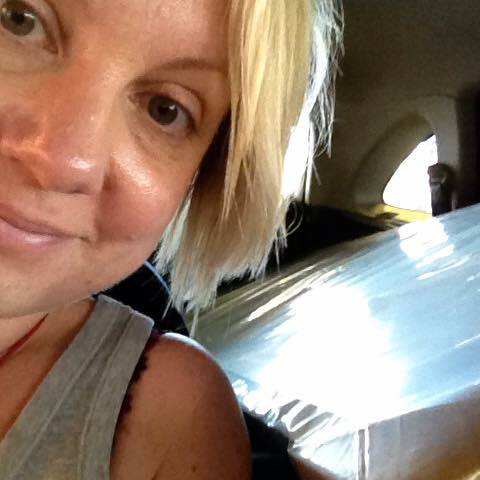 She commenced painting seriously in 2006 and her content includes her mother’s family country of Ngarrgooroon (Texas Downs Station), and figurative works of birds and animals as well as superb depictions of religious figurative paintings all complete with accurate information including stories and text from the Bible. She is a well educated woman, with both artistic talent and the will to succeed. 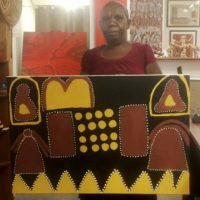 She has in-depth knowledge of her father’s family who have passed on to Jane the Culture and the Dreamings of his Kukatja heritage. Recently Jane has painted her version of a number of her father’s designs, producing amazingly strong works with minimal imaging. 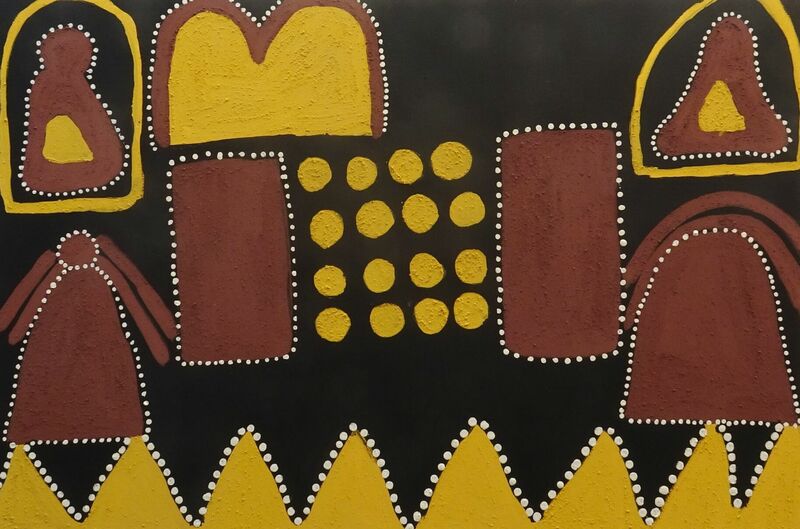 Jane uses the Traditional ochres of the Kimberley region with confidence and her works hold promise of a brilliant artistic future. She has recently participated in printmaking and etching workshops, and like her late father, Jane paints both for her art centre and as an independent artist. Jane has painted some of the richest cattle grazing land in the East Kimberley region together with the ‘jewel’ of the East Kimberley – the magnificent Purnululu National Park. This is Barramundi Dreaming country. The Kitja women tell the story of the women fishing for barramundi (Daiwal) with nets. One jumped out of the net, flew over the country and dropped its scales in the area where the Argyle Diamond Mine now is, making the country rich with the precious stones. Jane says of this area: “The tourists all love this place – lots of people come from all over the world to see this country. We are very lucky to live here”.